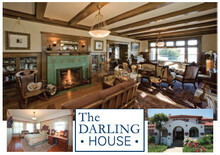 The Darling House is a 1910 oceanside architectural masterpiece designed by William Weeks in the Spanish Revival style. Lighted by the sun through beveled glass, Tiffany lamps and open hearths — and the grace of genuinely open hearts — your hosts welcome you into an experience of peaceful elegance. 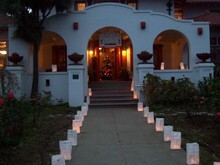 The atmosphere is ideal for small business retreats, organizational meetings and intimate weddings as well as couples, families and individuals. There are overflow accommodations for larger groups nearby. Guests enjoy strolling along an oceanside walkway, watching surfers, whales and sea otters at play, and lounging in the spacious living room or on the front veranda in addition to sightseeing in the area or recreation such as kayaking, SCUBA diving and sailing. 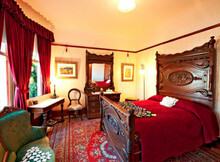 Special: 2 nights for the price of 1 weeknights through May 15, 2013. As the only bed and breakfast inn directly on Santa Cruz's beautiful oceanfront, visitors appreciate the soft ocean sounds at night and the sights of gently rolling waves.